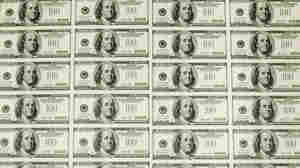 Sheets of $100 bills wait to be cut into singles at the Bureau of Engraving and Printing in Washington, D.C. In recent decades, the gap between rich and poor has widened in the United States. October 28, 2011  Why has the gap between wealthy and poor Americans gotten wider? Federal tax policy is part of the story. Those at the top of the income ladder have been the biggest beneficiaries of tax cuts over the last three decades, but the biggest change has come in the shape of the economy itself. 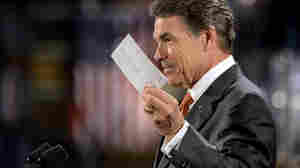 October 26, 2011  Republican presidential contender Rick Perry backed a flat tax plan Tuesday. It's an idea that has been around for some time. But it now appears to be gaining traction within the GOP. October 24, 2011  In the first of a series of executive actions designed to jumpstart the economy, President Obama Monday announces a new initiative to help homeowners refinance their mortgages. President Obama announced Friday that all U.S. troops will be out of Iraq by the end of this year, ending nearly nine years of war. October 21, 2011  Obama has always been opposed to the war in Iraq, and is fulfilling a campaign promise to bring the American involvement to an end. He says troop levels in Afghanistan will also be coming down. 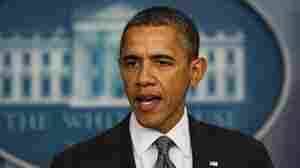 October 21, 2011  President Obama formally announces that combat troops will leave Iraq by the end of the year. 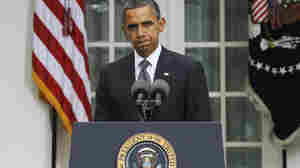 President Obama speaks in the White House Rose Garden to discuss the death of Libyan leader Moammar Gadhafi. Does Libya Offer Clues To An Obama Doctrine? October 21, 2011  The president said Moammar Gadhafi's death marked the end of a long and painful chapter for the Libyan people. But the seven-month military campaign that toppled the Libyan leader also marks a high point for the kind of international cooperation that Obama has championed. President Obama speaks at a YMCA in Jamestown, N.C., on Tuesday, during a three-day bus tour to promote his American Jobs Act. During the trip, he has drawn sharp lines between his jobs plan and the competing Republican plan. October 18, 2011  Throughout his bus tour in the South, the president has pushed his American Jobs Act and hammered at the competing Republican plan. The GOP strategy, which many of the Republican presidential contenders have adopted, relies heavily on lower tax rates, more domestic energy production and fewer government regulations. With his bus in the background, President Barack Obama greets people outside of Mast General Store in Boone, N.C., Monday. Obama is on a three-day bus tour promoting the American Jobs Act. October 18, 2011  President Obama is drawing sharp contrasts between his jobs plan and the ideas put forward by Republicans in Congress, as he continues his bus tour through North Carolina and Virginia. That may not bring his jobs plan any closer to passing, but it does help frame the argument for the 2012 election. October 17, 2011  Almost 50 years after the March on Washington, President Obama said barricades and bigotry have come down, but the nation still faces severe economic challenges and too many neighborhoods with too little hope. The president spoke at the long-delayed ceremony on Sunday. Hiring's Up, So Will Obama Keep His Job? 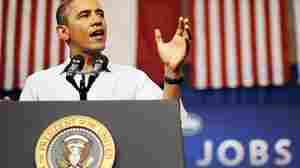 October 8, 2011  New jobs numbers came out Friday, reporting employers added more than 100,000 workers to their payrolls. That's better than many forecasters were expecting, but not good enough for the 14 million Americans who are still out of work. 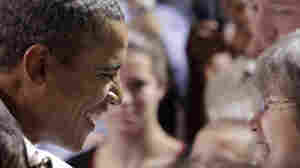 NPR's Scott Horsley reports on what the numbers tell us about the economy and what they mean for President Obama. The Occupy Wall Street movement has spread to Washington, D.C., Los Angeles and other cities. In L.A. Thursday, protesters gathered outside a Wells Fargo downtown, above, and at a Bank of America branch where some were arrested for trying to protest inside. October 7, 2011  Loosely organized protests that began on Wall Street last month have spread to other U.S. cities. President Obama says he understands the frustration conveyed by the Occupy Wall Street protest movement, and he's trying to channel that anger into support for his financial policies. 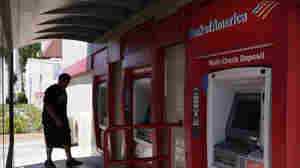 A man walks up to an ATM outside a Bank of America branch in Los Angeles. Bank of America has said it will charge customers a $5 monthly fee to use its debit card — a plan that has set off grumbling from consumer advocates at the highest levels. October 4, 2011  President Obama dived into the controversy over Bank of America's plan to start charging a monthly $5 fee for the use of its debit card, suggesting the bank is mistreating its customers. For its part, the bank says the new fee is designed to recoup the billions of dollars it is losing as a result of a consumer protection law.